Yorkshire struck six times after tea on day two to leave Lancashire forlornly chasing 323 in the Roses clash at Emirates Old Trafford. Having started day two with an 83-run lead, Yorkshire slipped to 21-3 before Jonny Bairstow’s 82 led them to 239 all out, which also included 55 for Harry Brook and Steve Patterson’s unbeaten 45. Lancashire started their chase immediately after tea and had 48 overs to bat, closing on 194-6. Joe Root (3) was caught behind off England team-mate Jimmy Anderson amidst an action-packed start to the day but later dismissed Jos Buttler for 59. Graham Onions dismissed Adam Lyth (4) and Kane Williamson (1) but Bairstow and Brook changed things in a flash. They shared 133 inside 20 overs, with Brook playing confidently on both sides of the wicket, while Bairstow was strong down the ground on the way to 50 off 38 balls. The pair brought up their century stand in only 13.2 overs, but Brook was caught behind in the final over before lunch, strangled down the leg side by Tom Bailey. Bairstow had been dropped on 22 by Matthew Parkinson at mid-on off Onions but was the first of six afternoon wickets to fall. Leg-spinner Parkinson and first-innings hat-trick hero Jordan Clark claimed two wickets apiece. Like Brook, Gary Ballance also fell caught behind down the leg-side off Bailey. Although conditions have aided bowlers all the way through, the visitors will be frustrated at losing wickets quickly at either end of their innings. After three for 21 at the start, they lost the last four for 28 after reaching 211-6. 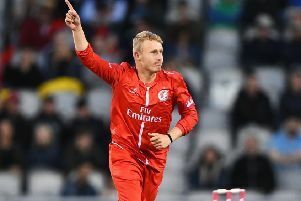 Lancashire wicketkeeper Dane Vilas, captaining the side with Liam Livingstone out of action with a fractured left thumb, claimed six victims in the innings. With Livingstone unlikely to bat unless things become desperate, the hosts effectively started their second innings one down. Alex Davies and Keaton Jennings shared 54 inside 14 overs for the first wicket before the former was trapped LBW by Tim Bresnan for 32 and Jennings fell the same way to Ben Coad. Haseeb Hameed made his highest Championship score of the season with 31 but, after seeing Vilas LBW to Josh Poysden, he was the first of two caught behinds in a Patterson over as Clark also fell to leave the score at 110-5. Buttler and Bailey gave Lancashire a late boost with a stand of 80, the former reaching 50 off 54 balls before falling to Root in the penultimate over, caught at leg slip.